Break the chicory into leaves which will form your ‘spoons’ and set aside. 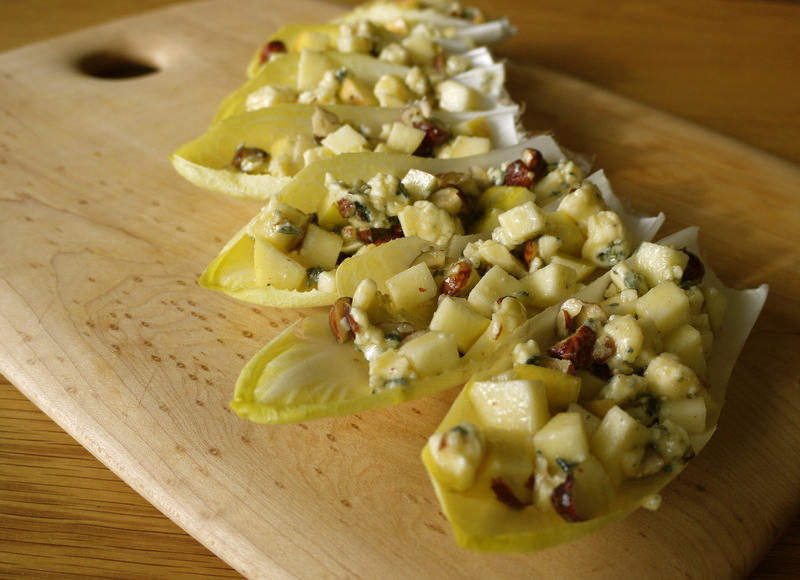 Core and chop the apple into small chunks, then crumble the blue cheese and mix the two together in a bowl. Next, roughly chop the hazelnuts and add to the bowl. Finally, make the dressing by popping the oil, vinegar, mustard and a little salt in a jar and shaking vigorously. Toss the salad in the dressing, spoon into the chicory leaves and serve whilst wearing your finest cocktail dress. Delicious! So good in fact that I happily overlooked the “verbing” (sic) of the word “prissy” – which works as well as this combination. I have always felt rather sorry for chicory (or ‘endives’ as the Belgians call them), forced in the dark and then cut off just as they begin to sprout, but they make a superb addition to a salad. They also work wonderfully well in that simplest of all traditional Belgian dishes, rolled in a thin slice of fresh ham, laid in an oven dish, coated with cheese sauce and baked to golden topped perfection in the oven, by when the vegetable has still enough bite to remind one of its salad origins. I agree. Poor chicory. And hurrah for the Belgians with that ham, cheese, chicory idea. Thanks for the tip, and for stopping by.